You know those days when you're hungry and tired and even sauteing up a few veggies for dinner sounds like the most onerous task imaginable? Living in this city means that we have a world of cuisines just at our fingertips - a few clicks on Seamless, and voila, 30 minutes later a yummy hot meal is at your door. Unfortunately, those yummy hot meals are also more often than not just a slick too greasy and just a lick too salty to be healthy. So for those nights, it's nice to have a home cooked healthy meal on hand for which all you need to do is to boil a pot of water. Enter home made pesto! 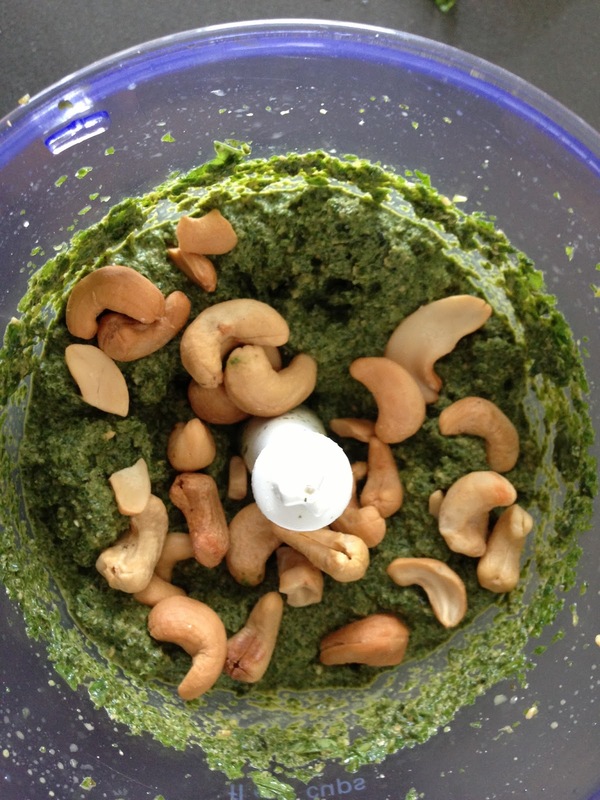 Full of nutritious greens with a generous helping of mint and basil to give it a fresh zing, and a scattering of cashew nuts to add a buttery richness. Rinse kale and spinach and roughly chop or tear to remove stalks. Bring a pot of water to boil, blanch the spinach and kale for about 2-3 minutes (or just until wilted), then plunge them into a waiting bowl full of ice water. 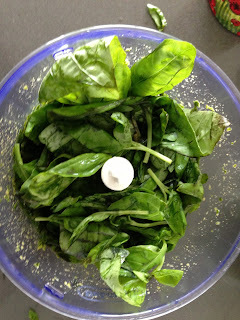 Remove from ice bath and drain well (you don't want your pesto to get watery!). In a food processor, pulse together all the ingredients until it is an evenly mixed paste. I had to make mine in batches since we only have a mini food processor (more than enough for our little family of two!) - if you do this, make sure to mix everything together evenly when you combine the batches at the end. 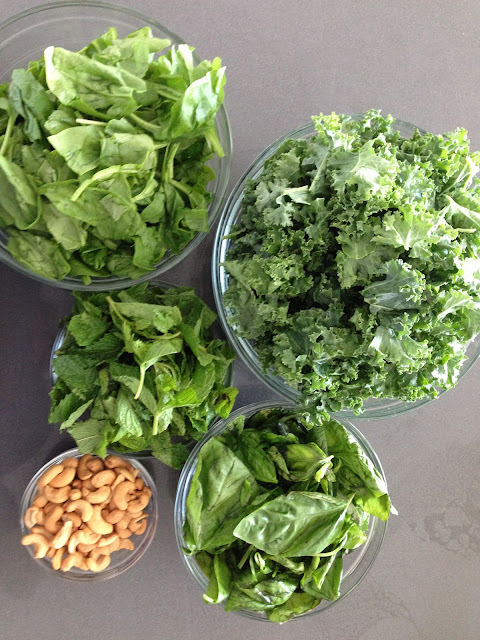 This makes about 4 cups of pesto. We've found that 1 cup makes a good meal for 2 with a lot of leftovers, so probably 1 cup serves between 2-4 people (especially if you add in some grilled chicken or something when you use the pesto with pasta). 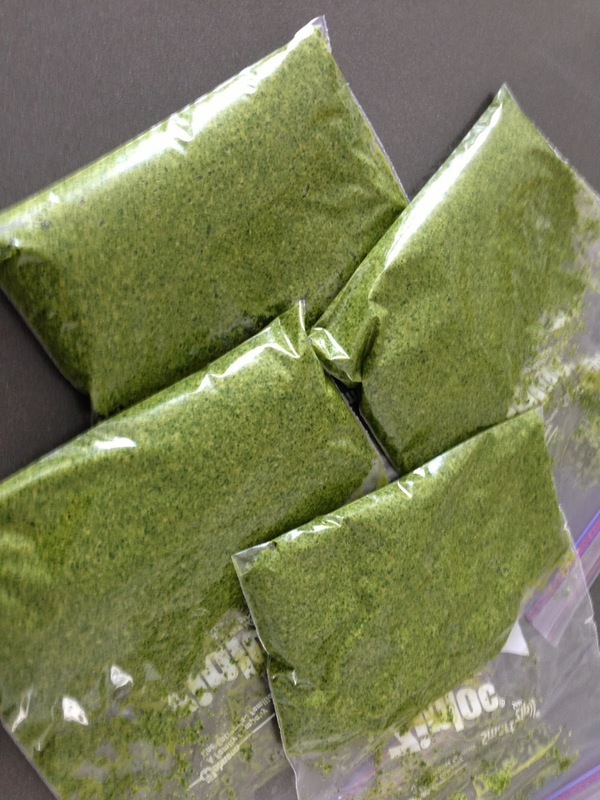 Divide the pesto evenly into 4 freezer bags. It should keep beautifully for at least 3 months (maybe even more, but I find we've used up our pesto within this time frame). 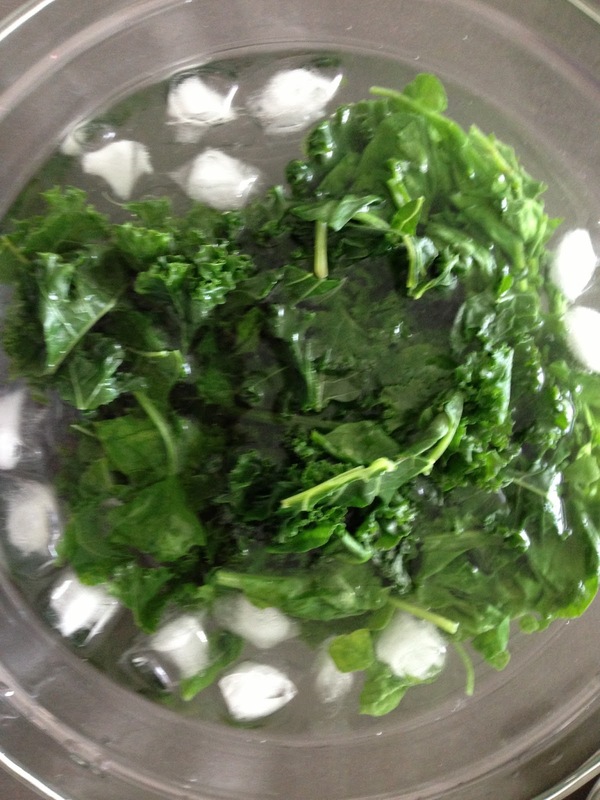 When you're ready to use, just remove from the freezer, pop the bag into a bowl full of warm water and let defrost. Serve with the pasta of your choice, freshly ground pepper, and some grated cheese. Mm mm. A tasty and super easy way to turn take-out night into a home-cooked night! P.s. 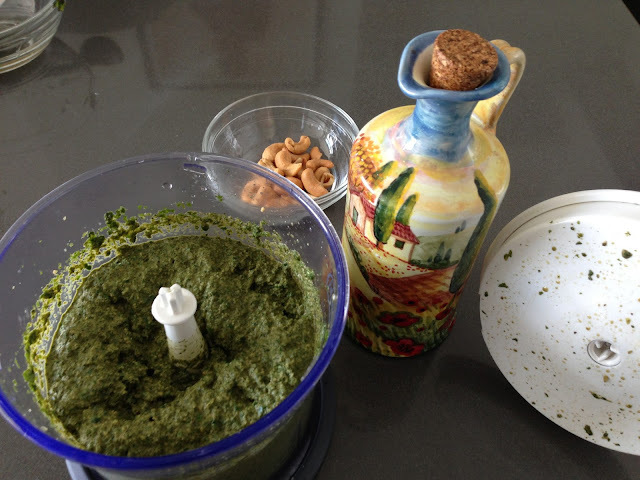 you'll see that I don't add any grated parmesan or pine nuts to my pesto. That's what I love about this dish - it's open to innumerable variations, depending on what you have at hand and what you want out of it. Remove the cheese to make it a bit healthier (ha, and add it back in when you eat it with pasta! ), use cashew nuts as a slightly cheaper and butterier alternative to pine nuts (I'll post another recipe later with walnuts, which are even more robust), and add spinach and kale to make it heartier and healthier. P.p.s. 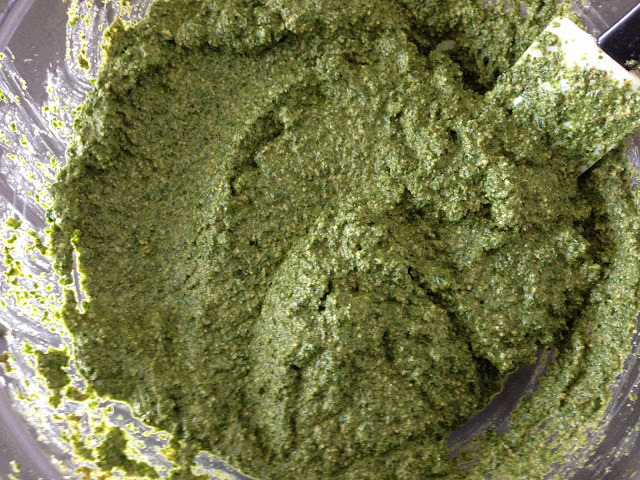 keep an eye out for an upcoming post on home-made pizza using this pesto as the sauce!